Early start on a chilly morning saw around 12 members set off for the ride up to London to show our respects. We arrived with a few minutes to spare at Wellington Gate Hyde Park and observed the 2 minute silence shared with many. After a bit of friendly banter with the local constabulary we watched the parade of scooters entering Hyde Park through the London Smog (2 stroke) most impressive sight. A coffee break at Carnaby Street then found us weaving our way out of the city in a manic search for the loo as it appeared most of London's petrol station facilities were out of order? Blinking cold run home which wasn't helped by one member losing their lights at around the Redhill mark, thanks to Tony and Steve for top and tailing my scoot down the dark country lanes. All back safe! Sunday the 15th Sept saw a gaggle of Bullseye members heading to Brighton to show the rockers what proper bikes look like! We would have arrived earlier but being Lambrettas we had our usual teething problems, lights not working, flat tyres etc much to the enjoyment of passing leather clad motorcyclists. Plenty of bikes to browse with each group showing its appreciation for bikes and scooters alike. Must admit it did feel strange mingling through the crowds of bikes with one eye out for that potential flying deckchair. After the annual Redhill steam fair being cancelled this year we were fortunate to be able to attend the Lingfield Steam Fair as exhibitors. A new venue for us to explore, plenty of exhibitors showing off their pride and joy in both steam and vintage / classic era's. The campsite allowed us to setup the new BBQ and build camp. A good weekend was had despite the lightning storm on the Saturday night, again some of us needed to dry out on the Sunday morning. Good venue, good company and a good time. Great ride out to Worthing for the annual custom car show on the Stein. Around a dozen Bullseye members rode down with the clouds chasing behind us. 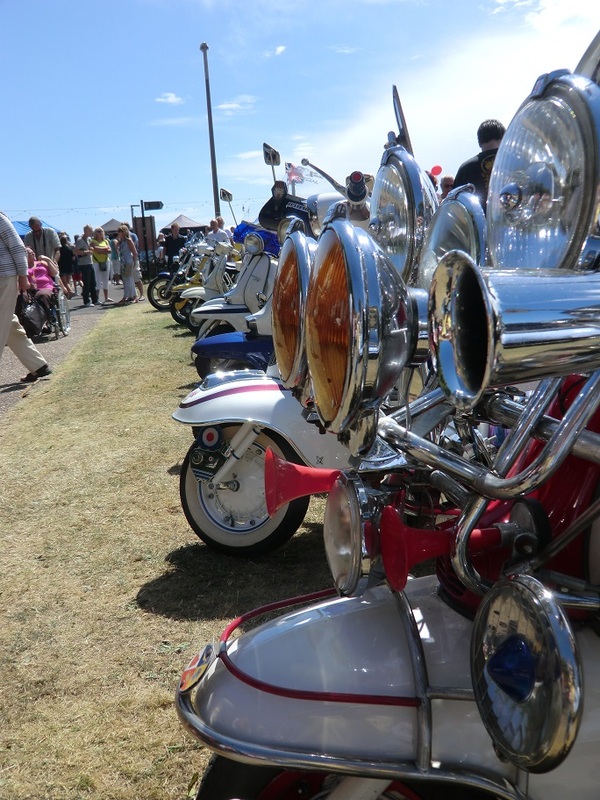 Plenty of classic vehicles to be seen with chrome a shining, a few coffee's and beers downed and a ride along the coast to Hove to catch the sun. A short stop on the cycle path to deal with a puncture and on to a new venue on the front. In all a good day out with friends. Our annual invite to Meedvale scout group fete took place this Saturday. Good breakfast was enjoyed at the Woodhatch café before the required pose around Reigate town centre. Arriving at the fete in the usual Bullseye manner (slightly late) a good welcome received from the public and a few more contacts made. Great village fete enjoyed by all with some returning with their tombola wins. The traditional visits to the local watering holes before a pleasant ride home. Good day out for the club ! A beautiful day was had on Sunday with a ride out to The Trevor Arms at Glyndebourne to sample some fine ales and listen to some Northern beats. As with tradition we had a couple of breakdowns on route, the first a clutch cable giving up 3m from base followed by a headlamp hanging on by its wires. With the sun shining we ventured from Glyndebourne with a lovely ride down to Madeira Drive for some snacks, back across Devils Dyke to a local watering hole and return home with some well earned rays. Great day out ! BullseyeSc held its AGM on Sunday 27/01/13 at The Greyhound in Crawley. The meeting was chaired by Phil and was well attended by both old and new faces with the usual friendly banter being present. The club reflected on a successful 2012 year and passed on it's thanks to all that had helped make the club a success. A Big Thank you was raised to Phil and Karen for all their hard work in organising the club, with a small gesture from its members. Donations from organised events had been given to charities of our choice for which the club is very grateful. A good spread of food was laid on with a taste of live music to accompany; the annual quiz took place with a free membership and goodies up for grabs.